One of our favourite things to do with visitors is go to the Sunday morning jazz brunch at Blue Note. We’ve probably been around 5 times now, and whilst the performances have been a little hit-and-miss in terms of the kind of jazz we like, the food is decent and the price extremely reasonable, so it’s always an enjoyable event. Tom’s parents are particularly keen on jazz, so for once we actually did some research about the group scheduled to play on the Sunday they were in town, and sadly we weren’t that impressed. Not-so-sadly, this meant expanding our horizons and looking into who was playing at some of the many other excellent jazz venues, and the Monday evening of their visit saw us all lining up outside the door to Smalls in the West Village. We had been advised to arrive early to get a good seat, and in fact got there so early they weren’t even open yet, so we had to while away some time in the wine bar next door, and were still around 4th in line when they started letting people in. A narrow staircase led down to the basement space, where we were greeted by a selection of mismatched chairs, a small stage area and an even smaller bar. The walls were hung with drawings, photos and posters of various jazz greats, and mirrors were positioned behind the players (which was actually a really good thing as from more than a couple of rows back the view of the performers wasn’t great). 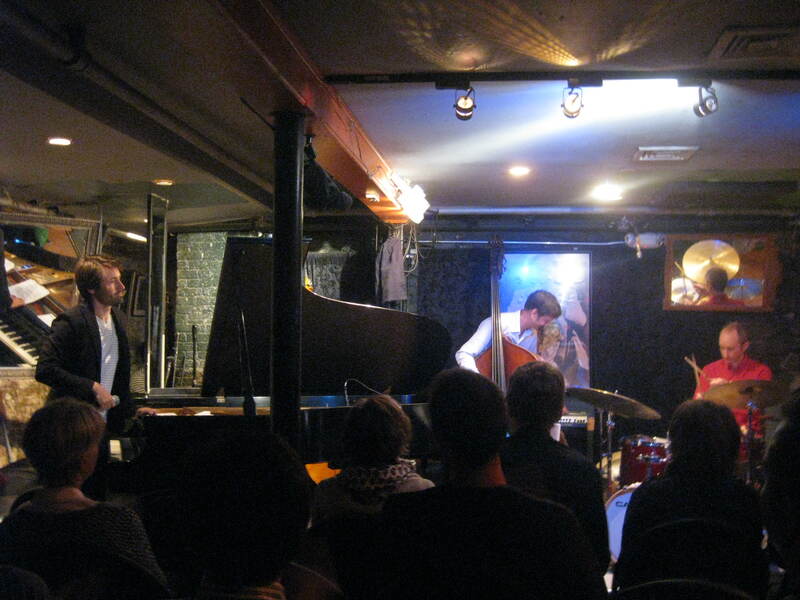 The group we had opted to see were the Dan Tepfer trio – the eponymous Dan is a pianist who seems to play with a variety of other musicians, this time it was bass and drums. Other than a brilliant cover version of Beyonce’s “Single ladies (put a ring on it)”, I believe that all of the music they played had been composed by Dan, and we enjoyed it very much indeed. I was also interested by the other members of the audience – an eclectic mix of tourists, students, a handful of professional-looking types, and several older afficionados. We stayed for the two sets that the trio played, and as we headed out at around 10:30pm it was clear the night was just beginning – I think there were two other groups scheduled to play sets, and the room was fuller than at any point since we’d arrived. It certainly felt like a much more ‘authentic’ New York jazz experience than Blue Note brunch, which is undeniably rather touristy (not that that’s necessarily a bad thing! ), although I’m sure that to get the proper experience we should have stayed at the club until the end of the night – maybe next time…! This entry was posted in Music and tagged Blue Note, jazz, Smalls by Emma Davidson. Bookmark the permalink. I’d forgotten the name of the group but now that you’ve reminded me I have a CD on its way . Excellent! I hope they’re as good on disc as they were live.